DALLAS--(BUSINESS WIRE)--Omnitracs, LLC, a global pioneer of fleet management solutions to transportation and logistics companies, today announced the acquisition of Blue Dot Solutions, a leading provider of cloud-based workflow software applications and platform solutions for the transportation industry. Omnitracs will integrate Blue Dot’s modern, cloud-native MilesAhead™ platform and product suite into Omnitracs One – the new, unified platform will offer the industry a solution with an unparalleled ability to improve the productivity, safety, flexibility, and scalability of overall fleet operations through seamless unified workflow experiences that feature modern user interfaces, visual presentation layers, and a high level of workflow configurability. By integrating the MilesAhead platform and products into Omnitracs One, drivers will be given a streamlined mobile user interface that will be highly intuitive, eliminate steps and wasted time spent on reporting. Through this acquisition, Omnitracs will set the pace for next-level driver satisfaction by easing the exhaustive administrative burden continually being placed on drivers. Established in 1988, Blue Dot is a leader in delivering modern unified driver and back-office workflow solutions for the trucking and transportation industry. 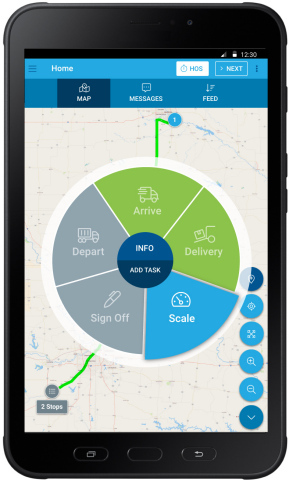 The Company’s MilesAhead product enables drivers, driver-managers, and other back-office personnel, to simplify their daily jobs and improve operational processes, leading to increased corporate financial performance and improved driver retention, recruitment, training, safety, and job satisfaction. Large global transportation companies have come to rely on MilesAhead to streamline and fill in the gaps for disparate telematics platforms, reduce dependence on expensive legacy systems, take back ownership of data, and add emerging technologies without disruption to the driver and back-office workflow experiences. Omnitracs, LLC is a global pioneer of trucking solutions for all business models. Omnitracs’ more than 1,000 employees deliver software-as-a-service-based solutions to help over 14,000 customers manage nearly 1,100,000 assets in more than 70 countries. The company pioneered the use of commercial vehicle telematics 30 years ago and serves today as a powerhouse of innovative, intuitive technologies. Omnitracs transforms the transportation industry through technology and insight, featuring best-in-class solutions for compliance, safety and security, productivity, telematics and tracking, transportation management (TMS), planning and delivery, data and analytics, and professional services.